Who Am I? And Why This Site? In June, 2002, I emerged from the djevo in Haiti and was baptized with the nom voyant, Mambo Fok Nou Viv. I'm rather fond of this name, which is kreyol for "il faut que nous vivons" or "we must live". The name was given to me by my godfather, a Haitian man named Jackie. I originally started working on this site as a focus for the research I was doing into Vodou. I had a relatively-common "the lwa are calling me to serve the spirits" experience, and I needed to start learning. So I bought a bunch of books, participated in a bunch of mailing lists, and tried my best to make sense of all the incoming information. 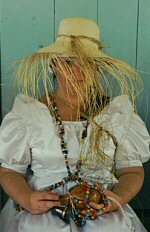 The majority of Vodou web sites are written by people who have converted. Converting to a religion isn't, in and of itself, a bad thing. I, myself, have done so. I was not born in a family that served the spirits. But I can't argue that my experience of serving the spirits is different than someone who grew up in a household where the spirits were served regularly. When Native American shamanism became all the rage among New Agers many years ago, a huge debate emerged about cultural appropriateion. My problem with a lot of these sites (and books) is that there is very little acknowledgement of that difference. Sometimes that difference can be opportune. I remember some of the things that I didn't understand about the spirits, and that makes it easier for me to explain things to people like me: North American new-age-types who did not grow up in a culture that served the spirits. But it's important to be honest about difference and ignorance. Many of the converts tend to stress two things: authenticity and specialness. As far as I and the Vodou community that initiated me are aware, I was the first white priest of Vodou in Europe; that is, the first white man to be ordained as a Houngan. Even now, I am one of only a handful of white men in the world who have been so ordained. The edge where different systems meet is always fertile	ground, in culture as well and nature. But for that meeting ground to	remain nurturing to all traditions, issues of entitlement and authenticity need to be addressed. And I believe that. People who talk about their specialness and authenticity make me nervous because I don't believe that they're critically examining those claims. They don't seem to critically examine what it means to claim authority about an indigenous religion. Many of these sites aren't clear about their sources. There really are only a handful of accessible books about Vodou, and some of these books regurgitate information. There are some things that I've read, that I've never been able to hear from an actual vodouwizan. I wish more more sites would be clear about their sources, because I'm not sure that they are really speaking about the religion that they learned from their maman kanzo or papa kanzo or if they're just telling me what they read in a book somewhere. I'm an initiated Mambo si pwen. In a lot of western mystery traditions (such as Wicca), initiation is treated as the reward for mastering certain skills and rituals associated with the religion. In Vodou, initiation is the beginning of a process of spiritual development. What this means is that I'm still learning how to serve the spirits. There are large numbers of areas that I haven't figured out. And because I didn't grow up in Haiti, I'm sure that there will always be nuances and aspects of the religion that will elude me. So if you read my pages, recognize that everything I say here is simply my best understanding and may, in fact, be wrong. Copyright © 2004 by B.C. Holmes. Last updated April 18th, 2004.